Because, if she’s being totally honest, Becca will admit the truth. Her heart belongs to someone else. For as long as she can remember, Travis Brennen has been unavailable. Becca’s parents are world-famous scientists and Travis’s dad is the caretaker on the Thornton family’s estate. Still, Becca can’t change the way she feels about him, no matter how hard her parents try to keep them apart. She’ll just need to find a way to prove to her parents that Travis isn’t the guy they’ve always assumed him to be. Becca’s earned the right to grow up, make her own choices, and fall in love, even if she ends up with a broken heart. 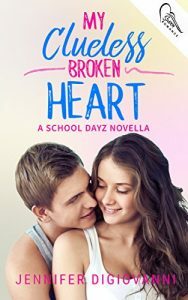 Win an eBook copy of My Clueless Broken Heart.